I have noticed a trend on many Facebook groups, Twitter posts, etc. A post will usually start with, "This is probably a stupid question but...."
At first, I find myself thinking that most of these answers are obvious. But usually, they are not. I was afraid to ask questions to seem like an idiot. When in reality, I was just new to all of this. How would I know what I could or could not do? I didn't know anyone in the military or any other military spouses. I created this list after thinking about the answers I felt were too "stupid" to ask. 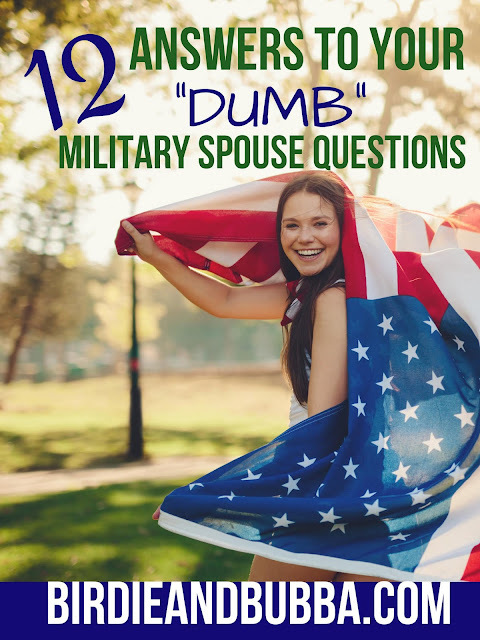 I can guarantee you EVERY SINGLE SPOUSE has thought about or asked some of these questions. 1. Does rank matter to me? Why don't we just get this one out of the way. Unless you are a military member yourself, rank does not apply to you. At all. Ever. I'm looking at you, women who have their spouse's rank on their cars....stop that. 2. I'm not married yet, can my spouse and I live together? If your spouse is an officer they are allowed to live off post. This can vary if they are overseas. Lower enlisted ranks like E1-E5 usually have to live in the barracks if they are not married and/or have no dependents. There are exceptions to this policy but they are made the discretion of the command. 3. Does the military pay to move you? The military will reimburse you for certain things pertaining to a PCS move. You have option to have the military move everything, some of what you own, or move all of it yourself. The military does not pay for any move unless you have orders. They will not pay for you to move home during a deployment. They do pay to move you if your spouse is going on an unaccompanied tour. If you are moving to a location where your spouse is already stationed, they will not pay for your move. 4. My friends/family want to visit. Can they get on post? Only those who have a DOD approved ID (Veteran ID, Dependent ID, Uniformed Services ID, etc.) are allowed to go on post without a visitor's pass. Most military bases will require a visitor's pass or DOD ID in order to get on post. To get a pass, you will need to head over to the visitor's center. These are usually located right outside of the main gate. Your visitors will have to bring some form of govt. ID and pass a background check in order to receive a visitor's pass. They can give you the pass the same day you apply or you can apply in advance. 5. What is my DEERS card for? The DEERS card shows that you are enrolled in the Defense Eligibility Enrollment System. This card is what gives you access to your benefits such as TRICARE (your health insurance). You also use this card to access post, use the gym, shop at the commissary, etc. Military members are automatically enrolled but dependents must be registered. 6. Does that mean I am automatically enrolled in dental as well? No. Enrollment in dental is separate from TRICARE. However, you can enroll through the TRICARE website. 7. Is on-post housing guaranteed? No. Some posts have better availability than others. During PCS season (the summer) you will probably be put on a wait list. You could be waiting two weeks to several months for a house. 8. How often will my spouse deploy? Depends on the needs of the military. They can be in for five years and have two or three deployments, or they could be in for eight years and have only one. Even if your spouse isn't in a combat mos, they're still just as needed when there is a deployment. 9. Can they send my spouse on an unaccompanied tour if we are married and have children. 10. Does the military take our choices for our next post into consideration? At the end of the day, they will send your spouse where they are needed. If your spouse has a more specialized mos or you have a dependent on EFMP, they will absolutely work with you. You'll hear some responses from spouses like, "We got our #1 choice!" or "Where is this base? This wasn't even on our list." 11. Why is my spouse annoyed that I posted the homecoming date on facebook? Because it could end up moving the homecoming date back even further, and making A LOT of people mad. OPSEC (Operational Security) are guidelines meant to protect military members and their families, especially online. Posting homecoming dates, deployment dates, troop movements, etc. is not allowed. 12. Is it really that hard to make friends with other spouses? Yes and no. Military posts are like train stations, people are always coming and leaving. I have made some great friends, only to have them move away four months later. It stinks. I have met spouses that I just didn't click with. But, I have also become close friends with some amazing people in the military and spouses alike. It is a support system you will need ESPECIALLY during deployments. I can't say that everyone shares the same sentiment I do but I take my friendships seriously. I love being able to say I have friends all over the world and can vent to them about all the craziness. Have any other "dumb" questions you would like answered? Leave a comment! !